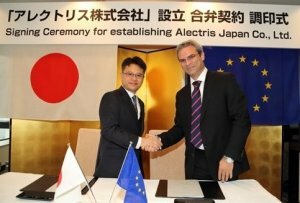 NAGANO, Japan and ATHENS, Greece – 29 March 2016: Alectris, a global solar asset care innovation firm, and Next Energy & Resources Co., Ltd., a mega-solar and industrial solar power plant company, today announced the formation of Alectris Japan Ltd., a joint venture in the fast growing Asia renewable energy market, offering integrated solar photovoltaic (PV) operations, maintenance and asset management services. Photo: Atsushi Ito, CEO Next Energy & Resources (Left) with Vassilis Papaeconomou, Managing Director, Alectris (Right) at signing ceremony for Alectris Japan Ltd.
By combining the best in class solar asset care services, software and expertise of Alectris with the proven local market expertise of Next Energy & Resources Co, the joint venture is positioned to immediately serve solar PV plant owners and operators in the region including global portfolio owners with assets in Japan. Japanese developers with assets in other countries will also benefit by the global capabilities of the joint venture. 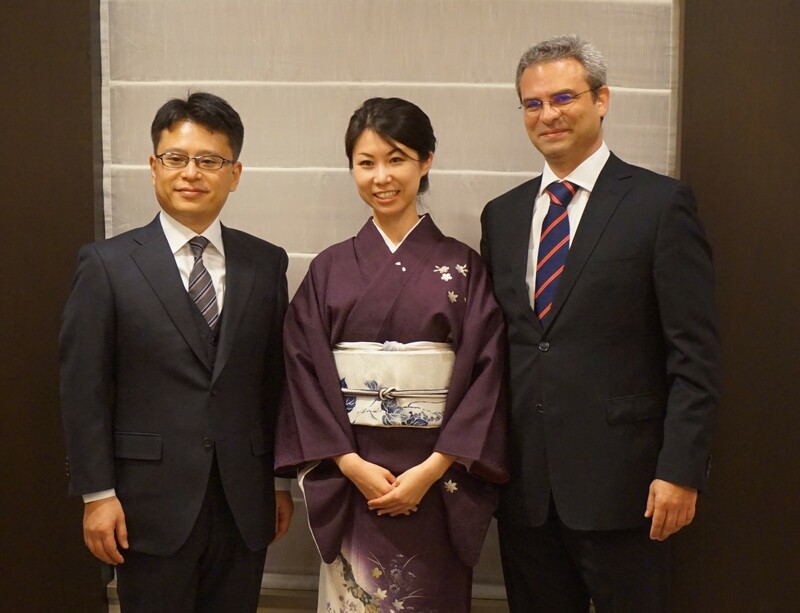 Atsushi Ito, Chief Executive Officer of Next Energy & Resources and Vassilis Papaeconomou, Managing Director of Alectris will serve as the Co-CEO’s of the newly formed Alectris Japan Limited. The company, with headquarters in Tokyo, started operations fully staffed locally. 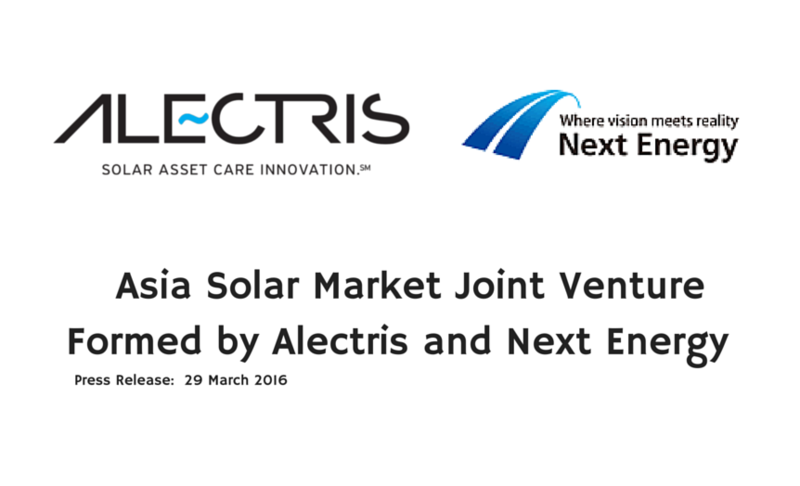 Services offered by Alectris Japan Limited include solar PV operations and maintenance (O&M) and asset management. Software and new technologies related to performance enhancement for existing sites are also being brought to the Asia market through the joint venture. These include ACTIS, the Alectris award winning Solar ERP (Enterprise Resource Planning) software now active in over 313 megawatts globally and new solar optimization technologies currently being tested in the European market. Photo: Atsushi Ito, CEO of Next Energy & Resources (Left), Vassilis Papaeconomou, Managing Director of Alectris (Right) and Ms. Azusa of Next Energy (center) at signing ceremony for Alectris Japan Ltd.
“By integrating both companies’ knowledge and expertise acquired throughout the world and respecting diversified customers’ requirements under rapid growing Asian market, we are aiming to provide better solution to the customers,” said Atsushi Ito, CEO of Next Energy & Resources Co., Ltd.
About Next Energy & Resources Co., Ltd. Founded in 2003 to forward the deployment of natural energy, Next Energy & Resources Co., Ltd. is a market leader in the development of solar photovoltaic (PV) power in Japan. The company builds all types of solar PV plants in a range of sizes from small scale kW systems to mega scale and industrial solar power plants. It offers a comprehensive range of services to design, construct and manage solar assets. Headquartered in Nagano, the company has offices throughout Japan. For more information, visit www.nextenergy.jp.